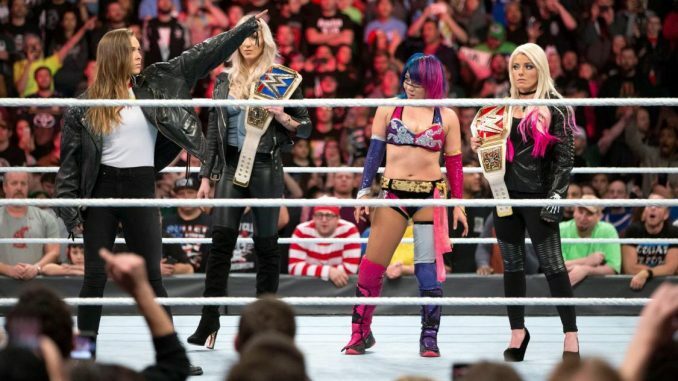 The major news coming out of Sunday’s Royal Rumble was the appearance at the end of the show by former UFC women’s bantamweight champion Ronda Rousey. Rousey entered the arena to her familiar theme of “Bad Reputation” by Joan Jett, following the women’s Royal Rumble match. Rousey entered the ring with Rumble winner Asuka, Raw women’s champion Alexa Bliss, and SmackDown women’s champion Charlotte. Rousey attempted to shake Asuka’s hand, pointed to the WrestleMania sign repeatedly and then shook hands with Stephanie McMahon at ringside to close the show. ESPN’s Ramona Shelburne reported that Rousey did, in fact, fly to Colombia to film “Mile 22” but returned to the U.S. on a charter jet and stayed away from the public for 24 hours and didn’t fly with her usual entourage for fear of being spotted. Rousey confirmed to Shelburne that she has been training at the WWE Performance Center for several months and would travel there on weekends. The WWE did make a deal to get the clearance for “Bad Reputation” ahead of time. Darren Rovell of ESPN added that Rousey has filed for three trademarks related to “Rowdy Ronda Rousey”.